P C Sorcar also known as Jadusamrat (Emperor of Magic) was a world famous Indian magician. He used to perform on stage during the 1960. He is known for his famous show Indrajal. 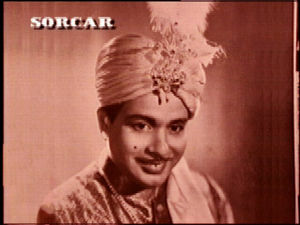 The full name of P C Sorcar is Protul Chandra Sorcar. He was born on 23 February 1913 in Tangail which is now part of Bangladesh. He was destined to be a great magician as he was born in a family where magic was practiced for a long time. His father was Bhagawan Chandra Sorcar and his mother was Kusum Kamini. He had a brother Atul Chandra Sorcar. He married to Basanti Devi. They had three sons – Manick Sorcar; P.C. Sorcar, Jr.;and P.C. Sorcar,Young. P C Sorcar was a brilliant student. He earned his I.A degree in 1931 from Karotia College with first class and B.A. degree from Ananda Mohan College. He learned magic from his teacher Genapati Chakraborty. He was very passionate about magic from his childhood. This was the reason that he chose magic as his profession though at that time it was not a very worthwhile profession. But he changed that thing. He not only became a great magician but also inspired other people to took magic as their profession. He started performing while he was a student. Gradually, his show attracted attention of people and he was quite famous during 1930. Initially he used to perform in Kolkata but with time he started in other places. He also started performing in other countries specially in Japan. This earned him a great reputation around the world. His show Indrajal became very famous internationally. He used to perform to the live audiences and on Television. He was honored with many awards in his life. He won the Sphinx award also known as Oscar of magic in 1946 and 1954. He was awarded Padma Shri in 1964. Beside that, a street in Kolkata is named after him. In 2010 Indian post issued a stamp to honor him. He also authored many books and articles on magic. His some of the books are “Magic for you”, “Indian Magic”, “Hindu Magic”, “History of Magic”. He took his last breath on 6 January 1971 in Japan while he was performing.